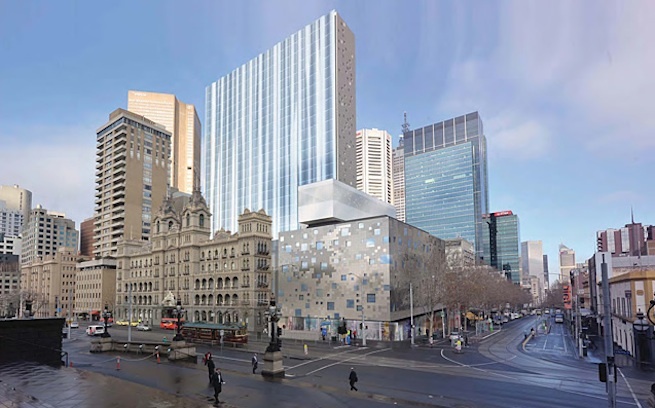 Melbourne’s Windsor Hotel redevelopment is back in the news. The owner, Halim Group, was seeking a 12 to 18 month extension to their planning permit, as they were not ready to start construction before the November deadline, set two years ago. Adi Halim received a letter from Matthew Guy, Minister for Planning, on the 18th. It refused an extension. The November ’10 permit [ PDF ] was issued after an appeal by the owners to maintain the original height of the corner building (on Bourke and Spring Streets). The appeal was unsuccessful, though they were awarded an extra 20 odd centimetres. The stated reason for the appeal was that the entire development was not economically viable unless they could retain the upper two storeys shown in the design originally submitted for approval. Halim didn’t get what they needed but haven’t abandoned the project. Since then little has been heard, publicly. Press releases on the development’s website ceased in May 2010. Media coverage of the project swung over to a lashing of the former Ministry for Planning. In 2011 The Age reported that the proposal was suffering financing woes. That’s about it…. until now. Halim group has signalled that the latter option is most likely, otherwise they are back to square one. The resulting redundancies and booking cancellations have the government crying ‘blackmail’. Anyway, DCM could be in for a busy couple of months. My God, that is appallingly ugly. I forgot how ghastly it was, not having seen anything about this for a couple of years.